« Saint Lazare » Jean-François De Bus, 150 x 120 cm. The gare Saint-Lazare: if you consider attentively this railroad hub, these locomotives, these express and omnibus trains, long-distance and local trains, resembles with its colored pipes, metal snakes whistling over our heads. The tracks are proliferating so densely that they hide the ground, they have almost obliterated all the greenery; and only some dwellings remain visible: how can trees, houses, and all that has to take root, still germinate on the ground, when all is circulation? The way things are going, Saint-Lazare has become a sale hasard (dirty chance, adverse happenstance, mishap). 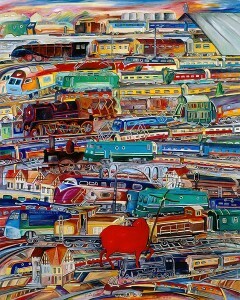 In India, sacred cows go idling on the railroad tracks for their bovine delight: watching at trains. In the West, the mystical lamb is a divine sign; in front of the Sale Hasard Station, the Lamb of the Holy Communion is passing by: only He is alive, the survivor of a world exclusively based on communications. The divine animal took His pilgrim’s staff and is going back in the great disturbance of the world, which it looks at with a dull look. All the locomotives are in use, from old fuel-fed models to those with electric trains, and all the roads lead, instead of Rome, to traffic blocks. 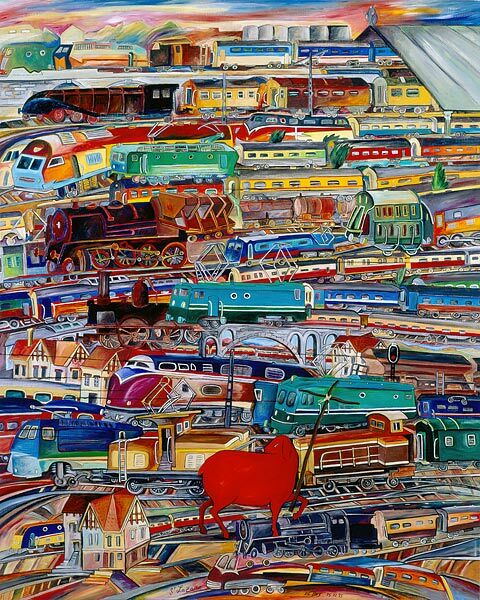 In the great derailment of the world, the Lamb crossed at the red light, like a signal: Terminus, everyone please exit!